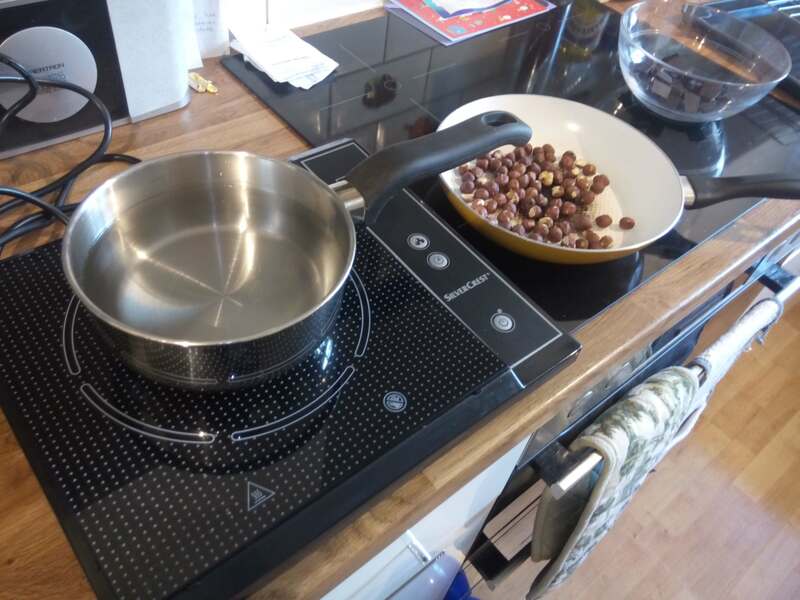 See how easy this one-pan portable induction hob is to use! 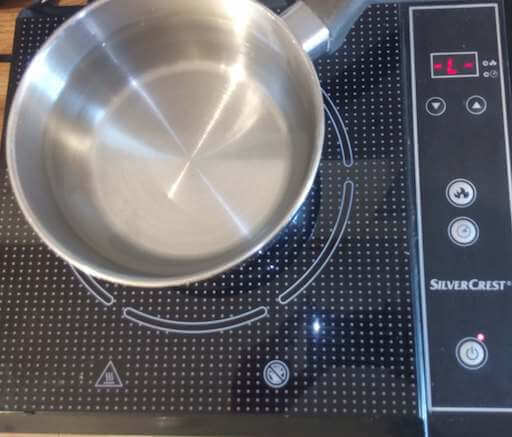 But how does it compare with a full built-in induction hob? Budget free-standing induction hob worked well while we camped out in the lounge, and continues to do well compared with a grown-up built-in hob. Fast to heat, light and small, a little noisy. A good portable hob that saw us through a kitchen refurb. May also be good for outside use at a barbeque. Friends have expressed an interest in borrowing it for holidays! Does need pans specifically suitable for induction cooking. I'm interested in alternative cooking methods for energy efficiency, and how acceptable they are to the cook. For example, it seems that a small efficient upright electric kettle can boil enough water for a cup of tea with a carbon footprint lower than using a hob (gas or electric) or even a microwave oven. At the very least I'm interested to know how an induction hob compares on that front, but also how usable it is compared to our current gas hob for our day-to-day cooking. 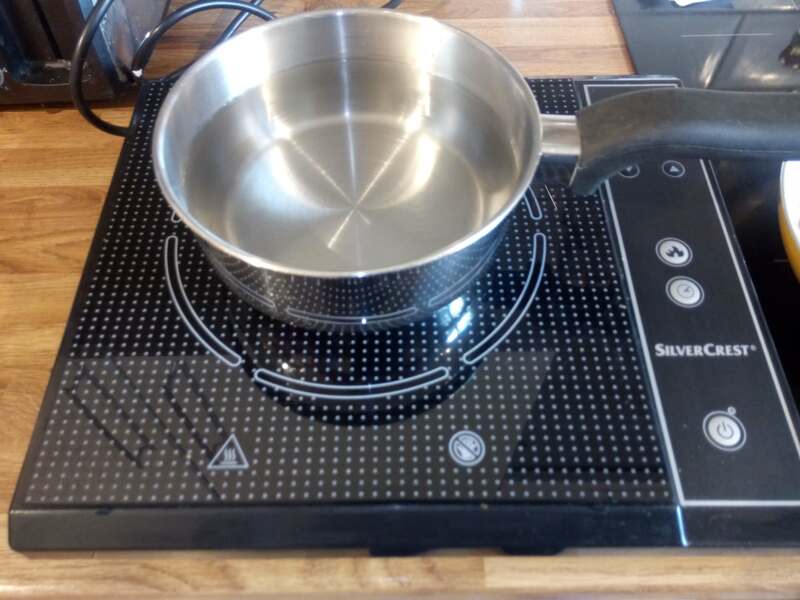 Lidl had an offer in 2010 on for a portable one-place induction hob (SilverCrest SIKP 2000 A1, 2kW for £29.99) and at a third of prices from other retailers I thought it would be worth a go! I assumed that while it would not work with our glass or aluminium pans, that it would work with our other metal (stainless steel) pans, but no. So after trying nearly every pan in the kitchen, and beginning to wonder if the hob was defective, I bought a £25 26cm frying/sauté pan with lid from Argos for induction hobs that will work happily on our gas hob too, and which was needed anyway. And thankfully it did work immediately when I got it home. As for the planned experiment: I never got a round tuit, but while our kitchen was getting refurbished in early 2013 Jean did our cooking on this hob, the microwave oven, and a little bit on a portable electric grill. It seemed to work well and safely without letting a lot of heat into the room. Jean gives this hob a 4/5 rating. Fast to heat up but a little noisy. Good to take on holiday or outside for a BBQ. Light and small. Our refurbished kitchen has an integrated 4-'ring' SMAKLIG IKEA induction hob. The move from gas to this has been roughly carbon-neutral. On first use Jean reported that the integrated hob seemed slower to start than the portable one. 2017/06/03: according to Mark W Tebbutt on Twitter: gas hobs were estimated to add 25–33% to the week-averaged indoor NO2 concentrations during summer & 35–39% in winter. So switching to induction should have a useful beneficial effect on health. 2017/05/20: having spent years using the IKEA SMAKLIG, I thought that it would be interesting to test them side by side again. The first things that Jean noted were that the SilverCrest seems to need unlocking (electronically) before use (for safety? ), and that its fan is relatively noisy. It's also possibly a little more fierce at the bottom end of the power range than the SMAKLIG. Though that may simply be a different spread that we could adjust to. Jean is not convinced that the SilverCrest could be used every day as it doesn't feel totally robust. The nominal power rating is ~2kW, so comparable with the SMAKLIG (2x2300W induction zone with booster; 3200W; 1x1400W induction zone with booster; 1800W; 1x1800W induction zone with booster; 2500W). The price of the SilverCrest is much less than a single pad of the SMAKLIG. But other than those details the SIKP 2000 still compares well with the SMAKLIG integrated hob even after years of practice with the latter! Instructions/manual for SIKP 2000 A1. First published 2010-11-07 , updated 2019-04-22 . Site copyright © 2007-2019 Damon Hart-Davis. Hosted by ExNet.